Delia Smith, the world's leading television cook, has announced plans to release a follow up to her latest book 'How to Cheat at Cooking' which has become another of the author’s phenomenally successful guides for the novice chef. The TV cook says that she came up with the idea for a series of 'cheating' books shortly after her tired and emotional appearance during the half-time break at the Norwich City versus Manchester City game in 2005. 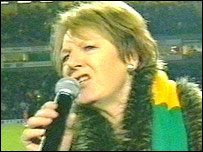 After a spirited first half supporting a lacklustre performance from the club in which she is a majority shareholder, Norwich, she took to the microphone and appealed to "the best football supporters in the world: we need a 12th man here. Where are you? Where are you? Let's be having you! Come on!" "Obviously I had been supporting the lads hard from the director’s box. When I wrestled the microphone from the club announcer I was so sure they could make more noise because I could see double the official attendance," said the TV cook. "It was then that I wondered how the fans could find the time for fine cuisine and still get to the pub for a few liveners before the game. So I thought I would share a few of my secrets." Delia said that she often had to knock-up a timesaving recipe using pre-prepared supermarket bought ingredients so that she could take her place at the player’s bar in time for the arrival of the ground staff at dawn. "If I am running late, I save time by getting the cheesecake straight from Sainsbury’s," said the nation’s favourite cook. "I can let it defrost on the radiator at the Wetherspoon’s near the ground whilst I have a quick eye-opener before the game. And a go on the quiz machine." Delia said that if it is a mid-week game then she has all the extra pressures of her busy media career to contend with and this can further reduce her time to prepare for the big match. "When you are in a rush don’t be afraid of canned ingredients, they are something you can just get out and they save loads of time," she said. "After a hard day and a head long rush to the ground in time for kick-off I find that a can of Tennent’s Super on the bus acts as a good relaxer." Many aspiring chefs wish to cook all their ingredients from scratch, however here Delia has a tip from her years of experience when trying to arrange a late night supper. "Hopefully the Canaries will have won, and after a few swift halves in the player’s dressing room, it is time to head home. However it is usually late, and whilst there is nothing better for supper than the famous Flemish beef in beer dish - ‘Carbonnade de boeuf à la flamande’, this is a perfect example of how to cheat at cooking," she said, repeatedly. "I use pre-cooked meat from a kebab and I save even more time by not stirring the beer into the recipe itself, I just wash it straight down with a can of Kestrel Export." Delia will be holding regular signings of the sequel, entitled ‘Cook by phone – Let’s be having you a takeaway’. Just take your copy along to the burnt-out Astra under the Carrow Bridge most nights after closing time at the ‘Queen of the Iceni’. Thông điệp bạn đăng tải tớ cảm nhận có lý, chắc phải bookmark lại xem tiếp. Sẵn đây mình muốn hỏi bên cậu có nhu cầu vận chuyển Hà Nội hoặc chuyen hang ra Sai Gon không vậy? Ngoài ra bên mình cũng chở thang may gia dinh 350kg, gia thang may tai khach từ HCM để vận chuyển đi Campuchia, van chuyen hang di Lao gia re hoặc vận chuyển hàng hoá Trung Quốc. Có gì pm cho mình, cảm ơn cậu nhiều nhé.